Your battery provides reserve power for all the electrical functions in your vehicle, while its primary role is to provide the necessary electrical power to start your car. The typical lifespan of a car battery is three to five years, after which it’s necessary to get a new one. If your vehicle will not crank over (like a dead battery) or some electrical functions aren’t working properly when the engine isn’t running, it might be time for a battery replacement. For 30 years, New Concept Auto Service has been your best choice for battery replacement in Overland Park. Our knowledgeable staff members are well-versed in electrical system diagnosis and repairs, including battery replacement, all the while offering the highest level of customer service in Johnson County. Not every dead battery means you need a replacement. Your vehicle may have a parasitic draw, a poor connection, or a charging system problem that presents itself as a battery issue. Our ASE-certified master technicians always perform a thorough diagnosis before a battery repair, so the root cause is accurately identified. Whether your Acura TL has a faulty alternator, your Jeep Wrangler has a blown fuse, or your Buick Enclave battery has a bad cell, you’ll always get complete diagnostics and reliable service from trained technicians. 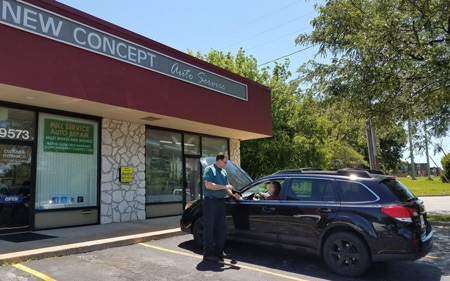 When battery replacement is required, we always use vehicle-specific original equipment or approved aftermarket batteries at New Concept Auto Service. We also will remind you when your replacement battery is four years old (the average lifespan), so you are not left stranded unexpectedly. Honest. Accurate. New Concept. Call us or use our online appointment form to schedule your battery repairs today! At New Concept Auto Service, you can rest assured that an ASE-certified technician is working on your battery repair. We have the expertise and training to repair any concern that pops up, from fluid leaks to worn out parts. We perform battery repairs on all domestic and import models, regardless of the vehicle’s age. We have the necessary diagnostic tools and the repair technology to efficiently and accurately perform your battery repair right the first time. It can be inconvenient trying to coordinate your battery repairs around your school classes or work, so we work around your schedule to make your visit as hassle-free as possible.